According to user reports on App Store, Facebook Messenger started to have crashing problem especially iPhone 8 devices and iOS 11 devices. The problem was already existing before but complaints have increased at 09.23.2017 about the problem and many iPhone users weren’t able to use the application this morning. The problem has also occurred other iPhone devices and iOS versions some time later. There is not any official statement or solution for Facebook Messenger crashing problem at the moment. However some users were able to find a solution by themselves and we will provide this information for you. We hope that it will work for you since there are also reports that this solution only helps some users for a few minutes. Update 1: Facebook officially stated that they will update Facebook Messenger for iOS devices very soon. This is how you can reinstall Facebook Messenger. However this is not 100% working solution. It is reported that this solution is just worked for some users of the application. Some iPhone users has reported that this solution worked for them for only a few minutes, then the application started to crash again. According to Downdetector.com more than 30.000 people has told that Facebook Messenger is not working or it is down. The problem has also occurred on iPad devices too. We are going to update this page if we find any alternative solutions for you. 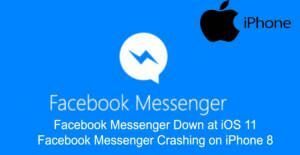 If you have any solutions or questions regarding Facebook Messenger Down at iOS 11 – Facebook Messenger Crashing on iPhone 8 problem, you can let us know with commenting this page. If you are facing this problem on Android, you can use our guideline for Android crashing.